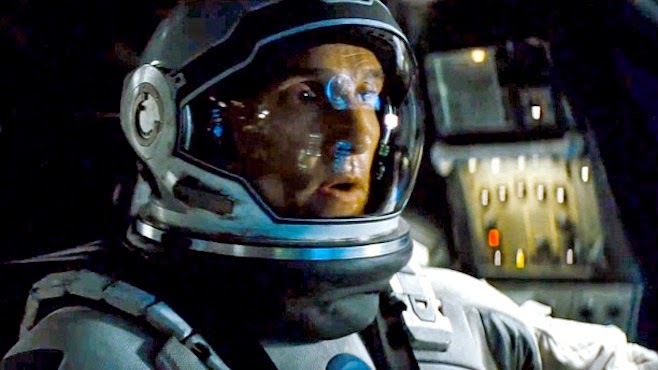 Christopher Nolan's latest Hollywood flick, "Interstellar" is clearly a film which is introducing a deeper understanding of our place in the larger scheme of things and the concept of a multidimensional reality, we only see a small aspect of. There is some scientific jargon used in the film which may not resonate so well with some, however the ideas explored are not exactly science fiction or pure imagination. Based on a deep understanding of a spiritual reality hidden from plain sight, Christopher Nolan's masterpiece sets to awaken human consciousness to a world beyond the physical and to the possibility of space travel. We don't necessarily have to trash this beautiful planet to reach the point where we have to leave our world in search of new habitable planets, and that's the message the film strives to drive home.
" Cooper (Matthew Mcconaughey), an ex NASA Astronaut who is now living as a farmer in a dusty town in futuristic America, where food has become scarce and life has become difficult, is one day led by a mysterious magnetic anomaly in his daughter's bedroom to a secret government facility in the middle of the Nevada Desert somewhere. It wasn't Area 51, but a secret NORAD facility no one was supposed to find. The mysterious magnetic anomaly in Murphy's room which she refers to as the 'Ghost' gives them co-ordinates to reach the NORAD facility which later puts Cooper on a mission towards a black hole which has opened up around Saturn, which they believe would lead them to another galaxy where they have better chances to explore habitable planets. This mission would be the second of its kind, after Captain Mann's mission which took 3 other NASA Astronauts through the same black whole and to 3 different planets with possible living conditions, named after the Scientists ... Miller's Planet, Edmund's Planet and Mann's Planet. Whirling through space past Mars, Jupiter the crew of Endurance, the spaceship docked onto a wheel like vehicle reach the Black Hole Gargantua near Saturn and go through it ... travelling through warped tunnels of space-time they emerge in another galaxy. They find the 3 planets they need to visit and start with Miller's planet which has plenty of water, the stuff of life. However, there are massive tidal waves on this planet as well which are way too humongous to be around. Just around the time Amelia Brand (Anne Hathway), one of the Crew discovers Miller's craft debris a huge tidal wave approaches them and takes out one of the crew. With only Amelia and Cooper left in charge, they set out for Mann's planet and wake up Dr. Mann (Matt Damon) from his cryogenic sleep, which he describes as waking him up from the dead. He does act a bit like a Zombie trying to throw Cooper of mountains and crevices on an Alien Planet because Cooper wanted to return to Earth as he had promised Murphy, his young daughter who was getting older much faster as compared to the time he has spent in space, relatively. With Cooper putting the original mission in jeopardy, Dr. Mann does his best in trying to get rid off Cooper and take off with his ship to the docking station on the Wheel. Somehow with the help of Amelia, Cooper manages to get on board Endurance and gives chase to Dr. Mann warning him not to try docking which Dr. Mann arrogantly ignores resulting in this explosion taking a part of the wheel and Mann's space craft with it. Cooper somehow manages to dock Endurance onto the Wheel now hurling towards Edmunds Planet where he drops off Amelia who always wanted to get to Edmund's planet first because she is in love with him and was hoping to find him alive there. Cooper on the other hand wanted to return to Earth so after having dropped of Amelia on Edmund's planet he goes straight for Gargantua, the black hole, which for some reason makes his spacecraft disintegrate on exiting from the other side. Following the warning sign to Eject, Cooper is propelled into space in his spacesuit ... with a distant planet in sight which looks a lot like Saturn ... with a space station / UFO right beside it. Now is when the movie gets really interesting as Cooper finds himself in a weird place ... which i believe is another dimension, perhaps the 5th dimension which Cooper experiences while having an Out of Body Experience (An OBE), which takes him to a place behind Murphy's bookshelf. He can now see Murphy and himself from the time he was about to leave on the mission to Gargantua and Beyond. He starts to give signs to Murphy so she can warn his past self from taking on this mission because he now knew they were never meant to return. However he takes on the mission .... and now he wakes up in a hospital bed, not behind the 5th dimensional space behind the bookshelf anymore where he was, bringing a new twist to the story. He is on what they call the Cooper station around Saturn. The robots found him with only a few minutes of oxygen left and managed to revive him, while he was having an OBE and was behind the bookshelf. The station was named after his daughter Murphy Cooper who was about a hundred years old now and had managed to solve the equation for escaping gravity which helped move all these folks from a messed up Earth to this space station around the Planet Saturn. And now after he is back he realizes he needs to head back to get Amelia Brand, from Edmund's Planet as she has no way to return on her own, leaving ample room for a sequel which hopefully opens new dimensions in human consciousness, previously unexplored. "